Have videos recorded by camera phone and want to play them on Mac macOS Sierra included)? Or just received some precious 3G2 videos from your friends and want to play them on QuickTime, iPad or iPhone? If you do have the exact or similar troubles like these, this article will help you deal with this. To play the 3G2 videos on your Apple stuffs like iPad, iPhone, you may know this: all of Apple portable devices and app only support several particular formats like MOV, so you have to convert 3G2 to Apple devices compatible formats (MOV for example). To convert 3G2 to MKV on Mac, I strongly recommend the professional 3G2 to QuickTime MOV Video Converter - iSkysoft Video Converter Ultimate. With it, you have all the videos under your control. It not only helps you do the video conversion quickly and flawlessly, but also provides some great presets for your devices. By choosing these presets, the output video could look great on your devices. 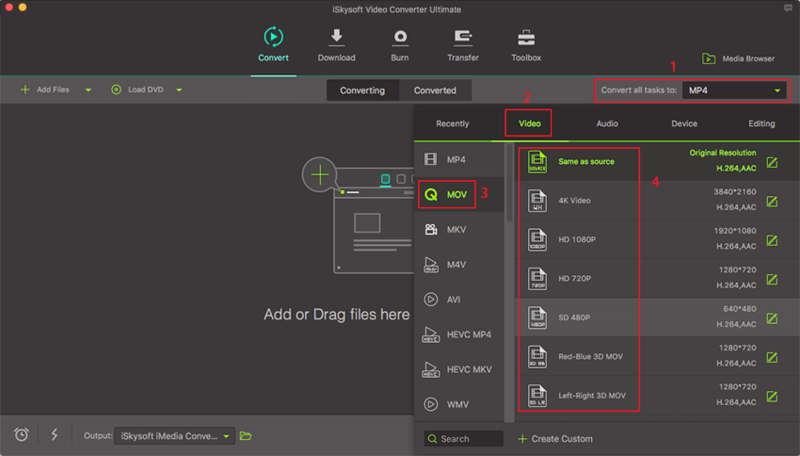 Versatile video conversion – Convert your videos to over 150 video formats with just a few clicks of your mouse. It converts both standard and HD video formats. Friendly user interface – The easy-to-use interface is simple to follow and anybody can convert their videos without any challenge. Convert your video at 90X speed – This is the fastest converter in the industry. Download video and use on your projects – You can get video form internet sites and include them in your projects. Built-in editor – iSkysoft Video Converter Ultimate for Mac comes with its own inbuilt video editor allowing you to trim, join, and even add special effects to your video clips. Various output devices – You can send your final video or audio production to any device, Facebook, Vimeo and YouTube; you can also burn your work on DVD. Drag & drop 3G2 files to the 3g2 to .mov Mac app. Or go to the main interface, choose "Add Files" to locate the 3G2 files you want to add. Here you need to choose "MOV" as the output video format in the format list. If you've wanted to extrac audios from these videos, choose one of audio format, like MP3 as the output format. If you want to put the output file on your iPad, iPhone or other popular portable devices, you can select an output format according to your device name! What's more, the target videos could be added to iTunes automatically, saving your time. Hit "Convert" let this professional Video Converter for Mac to do the rest for you! When the .3g2 to .mov conversion is done, you can play output MOV videos on your Mac, edit them in iMovie, Final Cut Pro, or use them on your iPad Pro, iPhone 6S/6, iPod for playback anytime you want. When you need to convert 3G2 to MOV online, these three tools are some of the best solutions to choose from. Convertio is an online tool that makes converting 3G2 to MOV a very simple process. Provided the video you want to convert doesn't exceed 100MB, you can simply upload the video from your computer, Dropbox or Google Drive and the conversion process begins almost immediately. The output is also of very high quality. • It is very easy to use and completely free. • It allows users to upload files from multiple sources including Google Drive and Dropbox. • The output is of very high quality. • It limits the size of video you can convert to 100MB. 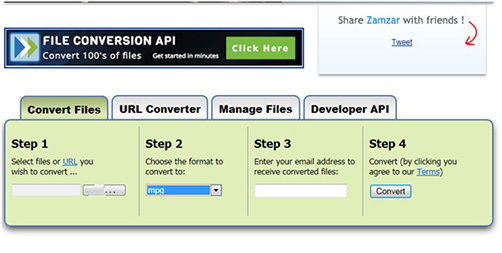 As one of the most popular online file conversion programs, Zamzar is a great place to go when you want to convert 3G2 files to MOV. The reason is because it is so simple to use. 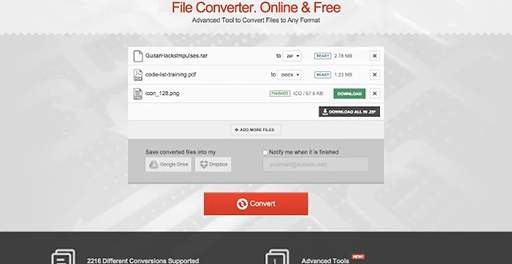 To convert any file, all you have to do is upload the file either from your computer or link and select the output format (in this case MOV. 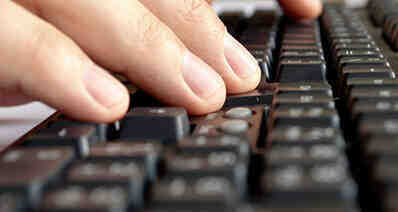 )The file is then easily converted and you receive a link to download it in the email address provided. • It is a highly effective file conversion system that you can use to convert different files from one format to another. • You have to provide your email address to receive the file. • It doesn't support Dropbox or Google Drive . As the name suggests, this is a free online tool that you can use to convert 3G2 files to MOV quickly and easily. While many other online file conversion tools are free, they often restrict the user in a variety of ways including restricting the number of times the user can convert a file. This is not the case with FreeFileConvert although you may have to deal with lots of ads on the site. • It is easy to use and completely free; you don't need to create an account to use it. • You can upload the file you want to convert from your computer, Cloud or URL. The 3G2 file is a medial file that was created by the 3rd Generation Partnership project 2(3GPP2.) This file format is primarily used to send and receive multimedia content over the internet and is also the regular format used by cell phones to save video files. It is an updated version of 3GP format so any program that plays 3GP can also play 3G2 files. 1. 3G2 video files are often of lower quality as compared to MOV files. This may also mean that they are relatively smaller in size. 2. Because of the lower quality and size, 3G2 files are ideal for transmitting media files. MOV files on the other hand are significantly larger and therefore not the ideal format for sending files. You may need to convert 3G2 to MOV when you want to edit a video or need to transmit it in a higher quality.